I ran across a report recently which stated the average American eats about 53 pounds of bread each year, and I’m probably well below that average. We don’t eat many fast food meals at our house, which minimizes sandwich bun and pizza crust consumption. Allen enjoys toast with McCutcheon’s Apple Butter for breakfast, and often snacks on a peanut butter sandwich, so he goes through most of the sliced bread we purchase. I lean more toward freshly baked breads because in my book, warm bread elevates an everyday meal to special occasion status. Mom’s Sunday waffles and fluffy biscuits are quick and easy treats in our regular breakfast rotation. Just a few weeks ago, we added Immaculate Baking Co.’s blueberry scones to the menu mix, and RoRo’s Cinn-A-Rolls are a hands-down favorite for tender, flaky, melt-in-your-mouth cinnamon rolls. Karen and I tasted them together on one of her visits to Texas and completely loved them. Karen loved them so much, she hid the leftover rolls from Jim when they got home! I have fresh breakfast breads pretty well covered, but I struggle with dinner breads. Although the time spent in baking yeast breads is very worthwhile, it is not a quick process. The window of opportunity to make fresh bread for a dinner meal at my house is frequently closed. Although I sometimes use frozen bread or dinner roll products, even they take several hours to thaw and rise. Thank goodness, RoRo (her “grandmother name”) and granddaughter, Amy, have just come to my rescue with their new Dinn-A-Rolls. I’ve been following RoRo’s Facebook page with great interest. The company is growing with larger facilities, new ovens, and more bakers to craft their small batch, handmade rolls. I’ve known for several weeks that Dinn-A-Rolls would soon be on the menu, and I picked them up at Central Market this week. 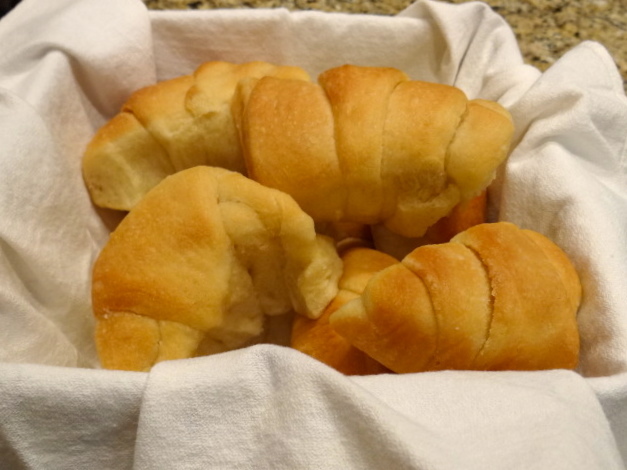 The crescent-shaped rolls are baked and frozen, so meal-time preparation is a snap. I thawed them on the kitchen counter, unwrapped them, covered them lightly with foil, popped them in the oven, and they were warm and fragrant in 10 minutes flat. 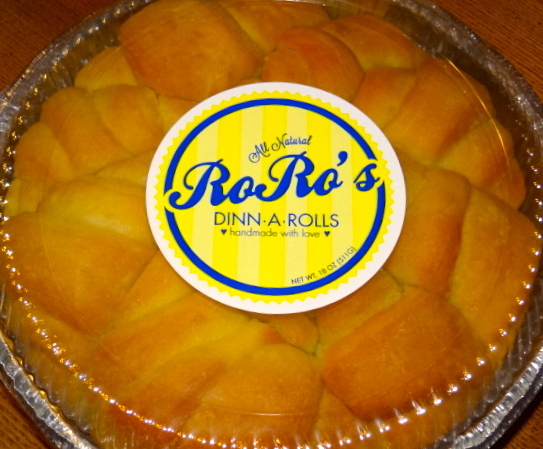 My taste buds go into overdrive when butter meets warm yeast rolls, and RoRo’s Dinn-A-Rolls are super scrumptious. The crescent shape allows alternating slightly crisp and tender layers. Just like Cinn-A-Rolls, this bread melts in your mouth. RoRo’s Baking Company ships their rolls if you can’t find them in a gourmet grocer near you. With RoRo’s filling the dinner bread gap at our house, I just might start inching up toward that average consumption of 53 pounds of bread per year!